We humans have a complicated relationship with our elderly. At times they’re admired, even celebrated, usually for their wisdom or success. Often, however, they’re brushed aside when they become more dependent and less productive. While we cherish those qualities in our young, we recoil, despite ourselves, when the same traits manifest in older generations. We don’t always know how to best care for senior citizens; we’re not quite comfortable with the reminder of what we are to become. Some pets, however, meet a different fate. When medical treatment becomes too expensive or care too intensive, when they are no longer a reliable watchdog or loyal running mate, when they become, in essence, a burden, they are turned out of their homes and abandoned. It is those discarded dogs to which Ulla Pedersen tends. 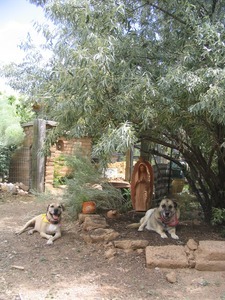 Kindred Spirits Animal Sanctuary occupies a quiet four acres off a semi-main artery outside Santa Fe, New Mexico. The day I visit is typical high desert: bright sun, clear skies. Pedersen, who I’d never met in person before, greets me with a hug. 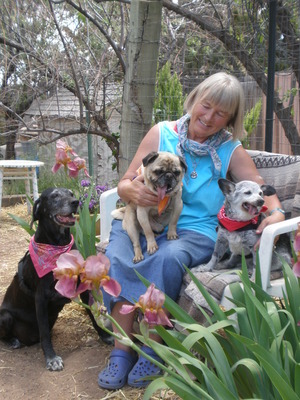 As she walks me around the grounds, she explains how her lifelong love of animals — she grew up on a farm in Denmark — and her years in the nursing profession somehow fused to form this eldercare and hospice sanctuary. Several of the dogs follow us around the property, including Eskaya, an elderly Lab mix. Though she’d had no urgent health issues, she’d been surrendered by her family to the county shelter at age 15. At her size, even a dog half her age is considered old. The shelter staff knew she wasn’t exactly a likely adoption candidate. They called Pedersen who promptly came for her. With her soft eyes and graying muzzle, Eskaya is clearly not a puppy. Nor is she infirm or sickly. She’s simply old. Happy. Healthy. Alert. And old. I mention to Pedersen how inspiring it is to see a big 15-year-old dog thriving and so energetic. Oh she came to us four years ago, Pedersen clarifies. Eskaya is a hearty 19-year-old now. At any one time, Kindred Spirits is home to three horses, 70 birds and fowl, and 20 dogs — but these aren’t absolute numbers, Pedersen tells me. Maximum occupancy is based on how much individual attention — not space — she can ensure each animal. Every single one needs to feel he or she is wanted. And though some do arrive with serious medical issues, for most, feeling wanted is the only treatment necessary. The sanctuary receives literally hundreds of calls each month from people looking to surrender their elderly dogs. I quickly do crude calculations in my head and realize that Pedersen could fill and refill the place several times over each week with animals in need. She takes every phone call, knowing that sometimes, the answers and advice she provides are enough to keep a dog in its current home. 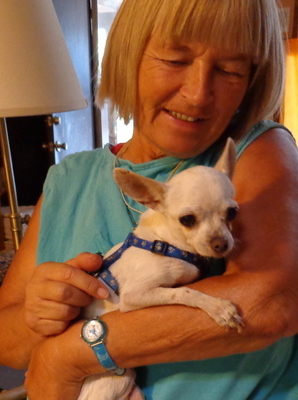 People are convinced that she can provide a better life for their aging pets. But Pedersen tells them that the best thing, nearly always, is for the animals to remain in the environment they know with the people they love. And how often do dogs get adopted here? I ask her. These animals aren’t up for adoption, Pedersen says. Our first priority is providing comfort and relief, be that physical or emotional, to those who are here, Pedersen explains. When these animals arrive, they’ve already been through so much. They’re scared, they don’t know who to trust. Some of them are blind or deaf or — both. But soon they know this is a safe place. They won’t go hungry or neglected. Once they’re here, they don’t have to adjust to someplace new ever again. No more changes, no more surprises. They are home. I try to imagine what it would be like to be left in the middle of nowhere, no shelter, no food or water, not a familiar soul around. I imagine wandering for days, hungry and confused. And then I think about how much more frightening it would be if I were old. Less resilient. Less strong. Vulnerable to the elements and to other animals, both human and predatory. No one should have to endure that, I think as Beatrice drifts from Pedersen to me and back again. She accepts our affection with tentative but unmistakable joy. I want to tell Pedersen that the world needs more humans like her, but even from our short acquaintance, I know she’d dismiss the compliment. Instead I say that we need more sanctuaries like Kindred Spirits. Pedersen reaches down to stroke her newest resident, as if to assure her it will all be ok. Beatrice seems to understand. For more information or to make a donation to the sanctuary, check out kindredspiritsnm.org. This is my vision for a better tomorrow. I’m considering providing hospice care to local animals one day, so this is inspirational for me. Thank you! What an amazing person. The world is a better place because of Ulla.